Berggruen Gallery is pleased to present Julian Lethbridge, an exhibition of twelve recent paintings by New York-based painter Julian Lethbridge. This show marks Lethbridge’s second solo exhibition with the gallery and will be on view November 29 through December 24, 2018. The gallery will host a reception for the artist on Thursday, November 29 from 5:00 to 7:00pm. Julian Lethbridge’s recent body of work probes the limits of depth, pattern, and rhythm translated through the formal elements of his medium: paint. Undulating patterns draw the eye across the canvas, creating a fluid sense of movement and flux, while thick impasto brushstrokes form a rippling surface texture that brings the medium to life. A symphony of curvilinear shapes forms intricate patterns that lend the canvas a tactile sense of depth, while the density achieved by successive layers of paint establishes a dynamic interplay of continuous geometry that is at once tumultuous and calm, impulsive and precise. This harmony of opposites lends Lethbridge’s work a visual spontaneity grounded in the artist’s controlled handling of color, tone, and spatial depth. The paint exudes an energetic dimensionality that recalls the dynamic mark-making of Abstract Expressionism, yet the intricate, lace-like patterns are subtle in their optical vibrations. To create this body of work, the artist demonstrates the signature process he has expanded and refined since the 1980s. Lethbridge relies on a loose grid to create the foundation of the painting’s composition before building up the surface with pigment and paint. He first employs narrow brushes – an inch or two wide – to create a myriad of layers combining both oil paints and pigment sticks. To finish, using thin metal bands Lethbridge then incises these layers of pigment to create each work’s sinuous textural pattern. These repetitive forms pay homage to the artist’s disciplined approach to compositional structure, yet the underlying grid is liberated and loosened by the painterly color passages and textural surfaces that activate meditative relationships between movement and light. This exhibition demonstrates the artist’s elegantly expanding palette. Painterly brushstrokes form rich, built up surfaces enhanced with vibrant applications of color echoed uniformly across the canvas, as Lethbridge subtly infuses his minimalist palette of black, white, and gray with energetic suffusions of color including warm hues of red, purple, blue, and pink. What emerges from this artistic process is the harmonious cadence of multiplying forms juxtaposed with the impulsive gesture of the artist’s hand, thus proposing a strong interplay between painterly and precise, unruly and composed. To view Lethbridge’s recent body of work is to expand one’s perception of painterly abstraction, further emphasizing the artist’s iconic style as a hallmark of contemporary painting. Born in Sri Lanka in 1947 and brought up primarily in England, Julian Lethbridge received his education at Winchester College and Cambridge University. 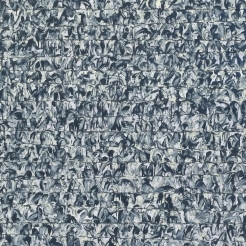 His work has been widely exhibited throughout the United States and Europe and can be found in the permanent collections of The Metropolitan Museum of Art, New York; The Whitney Museum of American Art , New York; The Tate Gallery, London; The Art Institute of Chicago, Chicago; and The National Gallery of Art, Washington D.C. In 1988, Julian Lethbridge was awarded the Francis J. Greenberger Award. He lives and works in New York. Julian Lethbridge, November 29 – December 24, 2018. On view at 10 Hawthorne Street, San Francisco, CA 94105. Images and preview are available upon request. For all inquiries, please contact the gallery by phone (415) 781-4629 or by email info@berggruen.com.